Diana Group Managing Director Sopin Thappajug (left) leads her group in making merit after donating Khao Pansaa candles to Wat Nongprue, Wat Khao Phothong and Wat Suttawas. The Diana Group and Pattaya Press Association donated candles to three temples for Buddhist Lent. 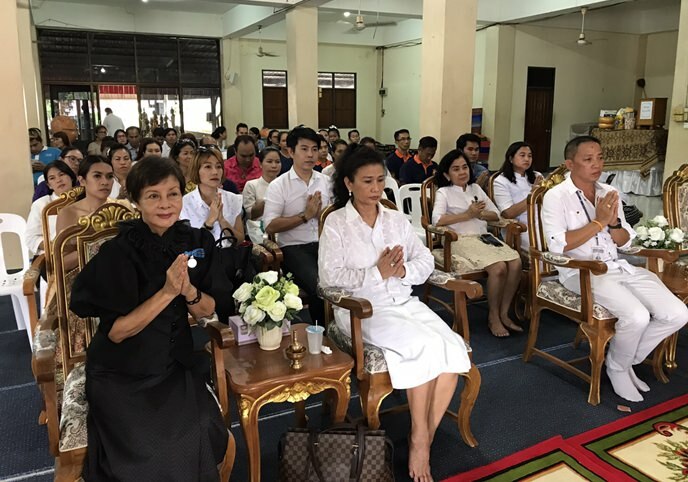 Hotel group Managing Director Sopin Thappajug and PPA President Samart Thongrod led the delegation to Nongprue, Khao Pho­thong and Sutthawat temples July 4. The candles were created with the support of Pattaya School No. 3, Thanachat Bank, Siam International Clinic, PPFBC Club, In Metal Thailand Ltd, the YWCA Bangkok-Pattaya Center and Baan Kru Jaa. Each group gathered funds to both make and purchase Khao Phansa candles for the July 9 holiday. Afterward, the group treated the children of Baan Kru Jaa to lunch.